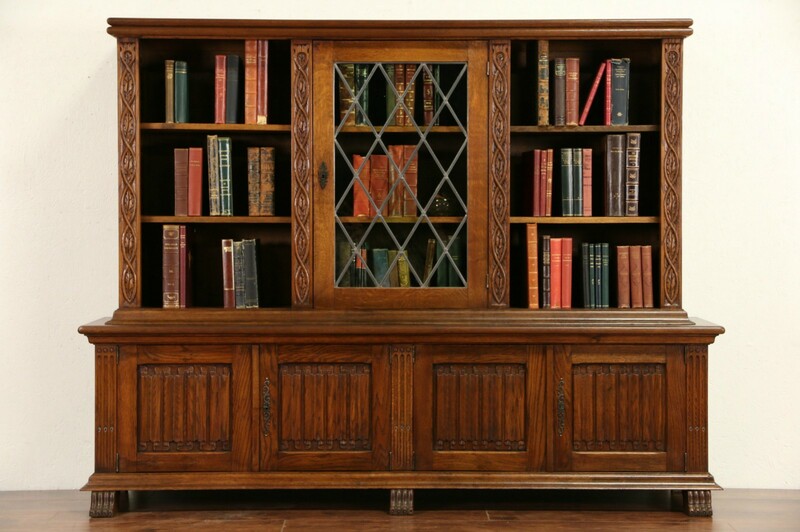 Hand carved of solid fine grained oak about 1920 in Holland, this library bookcase has a leaded stained glass door. Hand carved details, lion paw feet, raised side panels and "linen fold" panels are authentic. The tops of the separate base and upper cabinets have been revarnished for durability. The rest of the original shaded finish is in very fine condition, waxed and buffed, so all that is needed to maintain the warm antique patina is an occasional wipe with a soft dry cloth. There are small shrinkage separations from age. Wrought iron hardware is original, locks and keys work on this Dutch furniture. Dimensions are 6' 4" wide, 18" deep and 58 1/2" tall.